The restaurant business is in the midst of transformation driven by advances of the cloud, big data analytics, Internet of Things and growing preference of customers for seamless experiences. In the middle of this transformation is digital signage. The rise of more integrated and connected digital signage solutions is bringing unprecedented opportunities for the restaurant owners. Quick Service Restaurant operators are quickly discovering that changing menus over from paper and plastic to digital menu boards is just the start of a powerful digital makeover. Digital signage provides smart, interactive tools to engage customers in exciting and relevant ways. Interactive screens are being trialed in QSR environments as a mechanism to skip lines by placing orders and paying for them, without talking directly to the staff. When the order is ready, the patrons go to a pickup counter. The attraction for consumers is it’s fast, accurate and includes custom ordering (“No pickles!”). The attraction for operators is it allows for faster transactions and less cash handling, since customers are paying via credit/debit cards. These screens also reduce the risk for order errors and waste. When not in use, these screens aren’t sitting idle. They can be scheduled to display promotions or entertaining content. 1 – Equipment and safety training – Kitchens are full of ovens, dryers, sharp utensils and slippery surfaces. 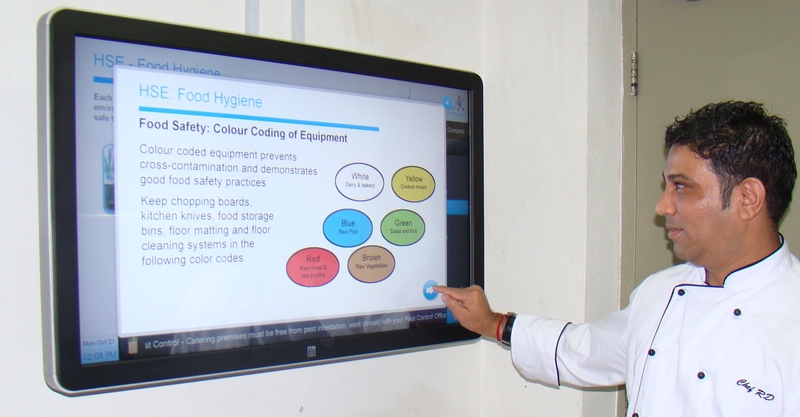 Digital screens can powerfully reinforce workplace safety and food safeties tips, and reduce liability and lost workday risks. 2 – Product knowledge – Operators in the hyper-competitive QSR business thrive or suffer based on the quality of customer service and customer engagement. Messaging that keeps staff informed on new offers and how to engage and speak effectively with customers is critical. 3 – Company communications – Typical QSR staff aren’t issued desktop PCs or mobile devices, or given email addresses, so the most effective way to ensure important HR messages reach employees are screens that staff invariably see throughout shifts. 4 – Performance metrics – Screens tied to management systems can display in real- time how the team is performing on key metrics, like service, drive-through order and delivery time. ComQi’s Content Management System (CMS) – EnGage enables food services owners and managers to tailor communications to their operations. Taking Control – Transformation is amazing in concept, but it doesn’t just happen. Tools are needed to manage the devices, data and content that results in seamless experiences that “just happen” for happy consumers. Something needs to be the hub, the control tower for all the moving parts and steadily changing data – an IoT-centric CMS (like EnGage) is ideally suited. 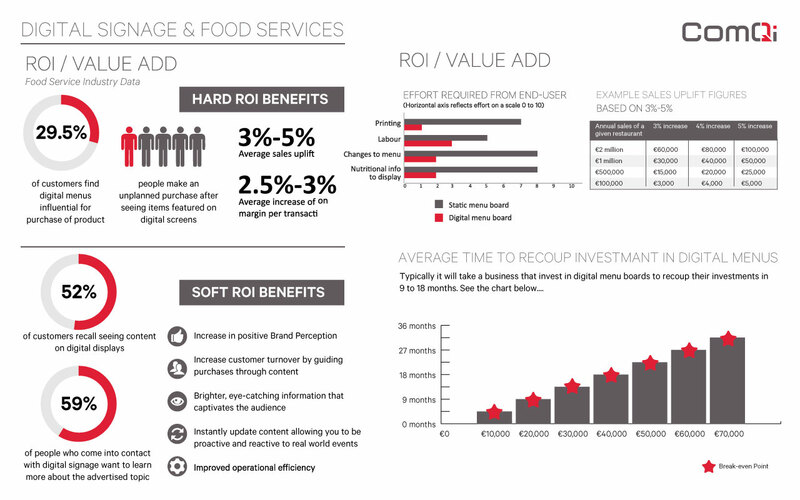 Scale – Thousands of active in-store smart hubs can be monetized and reproduced across additional market verticals. The rise of more integrated and connected digital signage solutions is bringing unprecedented opportunities for the restaurant owners, helping them achieve higher sales. The digital signage business has always talked about the core concept of getting the right content to the right place at just the right time. With all the data and devices, real- time content switching and very smart software, the consumer experience in restaurants can be enhanced. Ifti Ifhar serves as the CEO for ComQi, a global provider of Customer and Staff Engagement IoT (Internet of Things) based solutions. 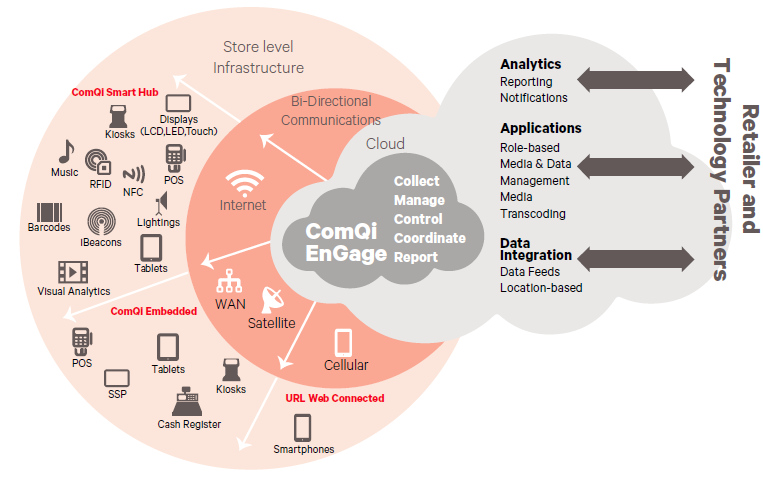 ComQi's CMS platform manages and controls all in-store digital touch-points such as digital signage, mobile, video, Beacons and RFID. 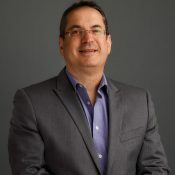 His prior experience is as President, CFO and COO for multinational tech firms.